Time: Another one workday. 8th of April, Thursday. The event is getting late... Everything starts around 20:00 instead of promised 19:00. Place: Vilnius, mediocre club with pretentious name - New York. So what's going on? The concert of three bands from USA: Inswarm, Jarboe and Nachtmystium. The first one seems quite unknown, though very promising. Two very active guys on the stage and some kind of instrumental/industrial music. So, they're from New York. From one New York, to another... The show quite short, but very inspiring, hard to leave the hall or even go further from the stage - very interesting not only to listen but also to watch. 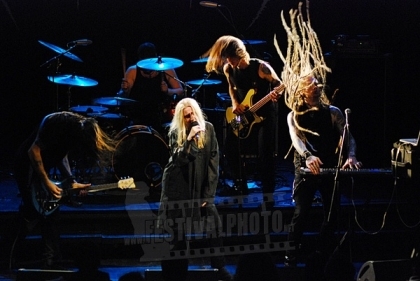 The second show on the stage - Jarboe. With the same two guys from Inswarm. A lot of people on stage (I guess, five?). Impresing performance from both instrumental+vocal and visual side. Everybody in the club is getting closer and closer to watch Jarboe herself walking with roses simply in audience. At the same time guys on the stage are already sweaty while creating powerful show and music for Jarboe. Applause. The last, though, really not the worst - Nachtmystium. Somewhere in the middle of their tour one of them simply left. Hell know the details but it seems, that this fact can be noticed in the mood of the band while performing. Besides short show (without encore), that was the only disatvantage of this show. The rest - very very energetic, creating small hell in the club and making audience go crazy. Fast, furious.. and friendly (FFF) guys do not forget their fans after the show - everyone, who wish can easily communicate with them. Hm, by the way, they look evil only on the stage.